A lot of political campaigns tout “grass-roots” efforts to convey their message. A lot of organizations, especially charities, like to describe themselves as “grass-roots.” But what does the term really mean? No, it’s not the musical group who belted out great songs like “Let’s Live for Today” and “Midnight Confessions” in the 1960s. Nor is it a simple term to explain, but simplicity is at the heart of what “grass-roots” is all about — especially at The Fuller Center. 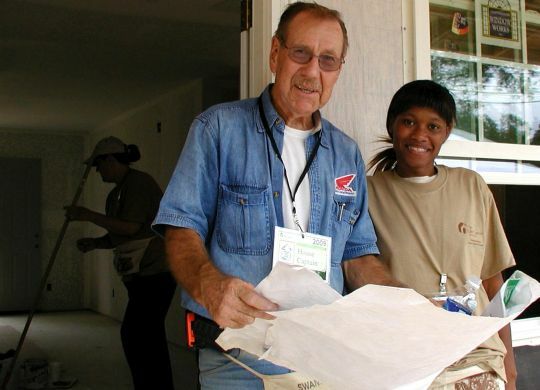 When Millard and Linda Fuller were forced out of Habitat for Humanity in 2005 — nearly 30 years after founding the nonprofit — it was heartbreaking for them, but Millard saw an opportunity. Tired of the corporate struggled he had enduring the previous 10 years or more, he recalled the simple days of the 1970s and early 1980s when his affordable housing ministry was just getting started. Some might say Millard was too committed to living simply. Some might think it was an overcorrection for the lavish lifestyle he had gained as a millionaire businessman in the 1960s before giving it all away to serve others. By the time 2005 rolled around, Habitat was not just a household name but had grown to have large offices in both Americus and Atlanta. Corporate influence on the board was growing. Fundraising, marketing and technology expanded. Habitat continued to grow by leaps and bounds. But Millard was concerned about the direction and the adherence to foundational principles. He wanted to ensure that a family “served” was actually a family housed. The head-butting continued until Millard and Linda got the boot from the nonprofit they had founded as an affordable housing ministry. It didn’t take long for Millard to seize an opportunity from that disappointment — and he, Linda and current President David Snell founded The Fuller Center for Housing as a return to the founding principles with which they had set out more than three decades earlier. They vowed that The Fuller Center would not stray from its grass-roots, Christian principles — the same principles that proved so effective in the early days. They vowed to be transparent and used clear words like families “housed” when reporting success. A family who simply attended a class on home ownership or whose current housing situation was merely evaluated would not be considered “housed.” They knew that donors wanted results — homes built and repaired — more than peripheral and tangential activities that may never result in homes built or repaired. Millard worked joyously and tirelessly for this restarted affordable housing ministry right up until the day he died unexpectedly in 2009. Linda said that his final years were some of the happiest of his life because he had been able to simplify and do what he really wanted to do with his life — help people in need. He was simply committed to putting faith into action. He was happy that he once again had a nonprofit that allowed him to make a direct impact without a hindering bureaucracy. The Fuller Center remains a grass-roots ministry. Simplicity guides the mission. Despite having more than 70 U.S. covenant partners and 21 international partners, the nonprofit’s headquarters remains a donated former Chinese restaurant in which a handful of dedicated staffers are committed to running a lean operation. They have forsaken larger salaries and greater benefit packages to serve the ministry because they believe in it. Because of our grass-roots commitment, 90 percent of donations go to work in the field with less than 10 percent going to overhead. (See latest independent financial audit.) Overhead is not inherently evil as it is important to keep the lights on and ensure that such dedicated staff is reasonably compensated for their efforts, but Fuller Center leadership is committed to maximizing every cent given to the ministry in the field where families are housed. Because of our grass-roots commitment, individual donors know that their donations make a bigger impact. A $6,000 gift can build an entire house in some countries. Donors know the feeling of direct impact that brought Millard such joy in his final years. Because of our grass-roots commitment, a company or business can work through The Fuller Center to build an entire community or transform an entire neighborhood. They can have far more direct impact. They can point to an actual project they made happen instead of simply sending out a press release about a large financial donation to a corporate nonprofit that went into the same ol’ big bucket with other such gifts. The Fuller Center is committed to growing the impact this ministry has on families in need of simple, decent places to live. But we remain committed to the grass-roots principles that maximize the impact. In fact, the question has been raised more than once: How do we grow and remain committed to our grass-roots principles? A whole panel of concerned thought leaders who care about this ministry has actually been convened to consider this question and offer guidance on the subject. We will never allow our commitment to growth to overtake our commitment to the simple, grass-roots, Christian principles that allowed this ministry to flourish in the first place. So, what does the term “grass-roots” mean to us? It means simplicity that allows the greatest direct impact.